Historical novels walk a tightrope between the truth and fiction. In order to succeed, an author needs to realistically convey a story that has, for the most part, already taken place. For the novelist, there is the opportunity to flesh out popular historical events that have simply existed for centuries as a marker on a timeline, giving those involved personality and humanity. Furthermore, the author also has to essentially stick to a script without straying too far in order to stay true to actual events. 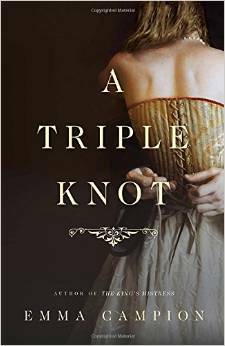 Emma Campion’s A Triple Knot, the fourteenth century novel of romance and court intrigue surrounding the famous “fair maid of Kent,” Joan, for the most part successfully weaves fiction and history together to deliver a solid and entertaining novel with colorful and believable characters involved in an all too realistic portrayal of the delicacies and dangers of royal court life in Europe. Set mostly in fourteenth century England and France, Campion’s novel mainly follows the precarious adolescence of Joan of Kent, her cousin Edward (later called ‘the Black Prince’), Will Montague, and her lifelong love Sir Thomas Holland. Joan’s life and her future, from the early age of twelve, are not her own because of her position as a cousin to the King and the daughter of a marked usurper and traitor to the crown of England. To add to the discomfort of Joan’s position, from early childhood, her cousin Ned (Prince Edward), an odd tempered child vows to make her his future queen and continually lavishes attention, affection, and scorn upon her depending on his impish childish whims. Soon after blossoming into womanhood (at twelve in the novel, but much older according to some historical accounts), Joan finds herself trapped by the King in an attempt to arrange a strategical marriage in order to gain political favor and finances for his growing conflict with France. 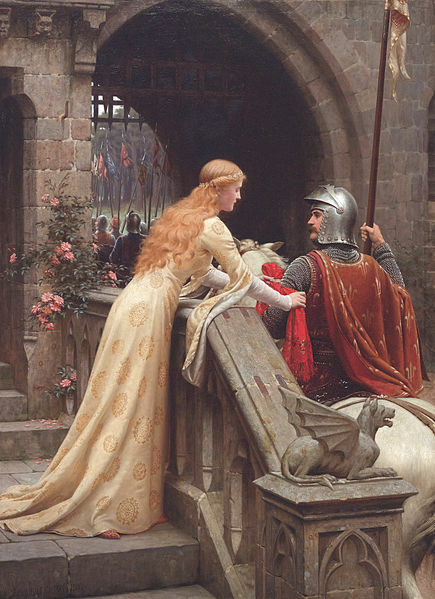 The child, recoiling from the animalistic advances of her proposed betrothed’s father, rushes into the arms of her honorable Sir Thomas Holland, who, in Campion’s novel, lives in text as the personification of the chivalric and gallant knight. Strong, tender, quick tempered, noble, and handsome, Holland sweeps Joan off her feet with his delicate attentions and captures the young girl’s heart. For Holland, the blossoming beauty, with her gentle charms also captures his heart, making a mutual love in a very dangerous situation. Scheming nobles push Joan and Thomas into a clandestine wedding in the middle of the night in order to save Lady Joan’s future and validate the couple’s seemingly undying devotion for each other, but political functions and the desires of King and Joan’s own family soon rips Holland and his child bride apart, almost moments after the two consummate their whirlwind romance and marriage. The most fascinating portion of Campion’s book follows Thomas and Joan’s undying efforts to remain true to each other and their secret wedding vows while the court of England decides their fate without much concern for their feelings. In reality, there is truth to the idea that Joan and Holland held between each other a fiery and undying passion. Kent, who went on to marry a second time after Holland’s death (I will not spoil the plot by revealing her other spouse), asked to be buried by her first husband at the time of her own demise. Pirates, political intrigue, plague, and war constantly emerge as obstacles as the years pass. The fair maiden of Kent grows into a strong and willful woman as the world in which she lives often throws her into the jaws of chaos. Joan finds herself forcefully married off to William of Montague (a sympathetic, but often two dimensional character in the book who Campion portrays as perhaps homosexual and obsessed with pleasing prince Ned) while simultaneously fighting off the advances of her cousin and heir to the throne (Edward, the Black Prince). Ned’s advances are mostly unwanted and teetering on the edge of disturbing as the young boy often turns into a darkly cynical, taunting, and cruel suitor who will do anything he can (regardless of how he hurts those in his path) to have the prize he wants. The novel, at its core, is the fascinating love story between Joan and Thomas and it follows them as each (often separated from each other) attempt to manipulate their difficult situations so they can at last live as husband and wife. The appeal of Campion’s novel lies in her ability to pull the reader into the landscape of the fourteenth century, while not losing sight of her tale. Using the plague, war, crusading, and even the complicated situation of the Pope residing at Avignon, Campion delivers a historically accurate setting while fleshing out likable, interesting, and believable personalities for her characters. Weakness, frailty, and the flaw-ridden truth of human nature exists in most of Campion’s characters and no one appears unblemished. I found Campion’s characters both main and periphery, to be fleshed out for the most part and spectacularly imperfect. Joan can be indecisive, stubborn, and yet easily led, the trappings of an adolescent that Campion could have easily glossed over in order to portray a more majestic and idealized main character. Her mother Margaret, a shamed royal widow with an impossible love affair to a married man, seems conflicted, tortured, and dejected at her forced difficult situation. For the most part, these fictional manifestations of English royalty live up to high expectations (I am a historian and once a character feels as if it deviates from what I know or have read of a person, I lose interest) and kept me deeply involved in the book. In the end, the novel was engrossing, entertaining, and well worth the last bit of summer vacation freedom I had before rushing back to a hefty graduate school itinerary and mostly non-fiction reading. Triple Knot did have some problems. The first two-thirds of the book flowed as a cohesive and engaging plot, especially with the looming threat of war, disease, and the fear that even the Pope may not possess enough power to finally reunite Sir Thomas and his fair Joan. Court politics, battle encampments, and chilly landscapes emphasized the distance between the two lovers and Campion’s skill at literary subtly enabled her to write a convincing romance novel without stepping into the realm of melodrama. On the other hand, Campion, while fleshing out her three main characters extensively, often left gaping holes in others. Will often appeared as a two-dimensional weakling closet homosexual who is torn between his obsession with Prince Ned (jealous at times of Ned’s attentions to Joan) and his desire to prove his worth as a noble and husband to Joan. For me, Will appeared too stereotypical and disappointing. Campion, had the opportunity to flesh out Will, explain the difficulty of his own position and the hardships and emotional turmoil he faced, but she took the easy way out and often portrayed him as weak and whiney. The two have a few rare tender moments where Joan feels sorry for the young men obviously pushed into a marriage neither desired. Will’s personality is at best, bland and his one bout of drunken physical violence while holding Joan captive in a remote part of Wales does not fit into the whole of his demeanor and thus makes the entire scene feel forced and unauthentic. Moreover, other “side” characters including Bella, Efa, and Lucienne, each contribute heavily to the progression of the plot, and yet as a reader I never fully understood their motivations or intentions because they failed to materialize completely as whole characters. These women had potential and sat just on the cusp of development, but ultimately fell short of what I thought necessary. Finally, Campion’s book began to rush its plot towards the end. The resolution of the Holland / Montague marriage question comes well before the book closes and follows Joan and her family as they continue to work towards happiness while managing the difficulties of having royal blood. Essentially, the last third of the book felt very rushed and disjointed. Although not unpleasant and still entertaining, Joan’s decisions and the close of the book do not contain the same level of explanation and detail, leaving me as a reader with huge questions about resolution and motive. In all Campion’s A Triple Knot is a thoroughly engaging and entertaining historical novel, one that succeeds in recreating true events with historically accurate detail and believable characters. The plot is easy to fall into, the book a delight to read, and even with a few holes in content and character development, Campion delivers a romance novel that truly represents the age of knights, tournaments, fair maidens, and chivalric love without falling into the overly sticky and sweet trap of melodrama and hyper-sexualized love making. I enjoyed the book and I found Campion’s attention to historical detail and honesty refreshing. This is an easy book to read and like, I highly recommend it. Previous Post Blogger Vent Corner: The Quandary of Slow Publishers & Imminent Archival Dates: Why the Archival Vault needs to go?